The Barwell Court Farm BHS TREC took place on 20th and 21st August 2011 in support of Epsom Riding for the Disabled Association and St Raphael's Hospice, at Barwell Court Farm, Racecourse Field, Common Lane, Claygate, Surrey, KT10 0HY. 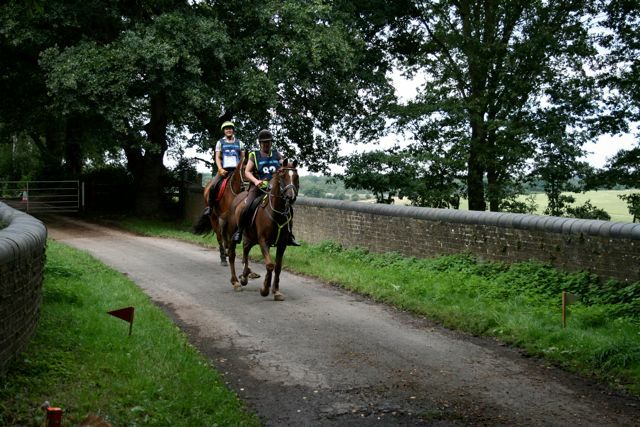 Carol and Emily Dolbey-Brown, with steam rising from Pharoah and Bertie, at d'Abernon Chase Level 2 CP4, soon after the rain had stopped and the sun had returned. 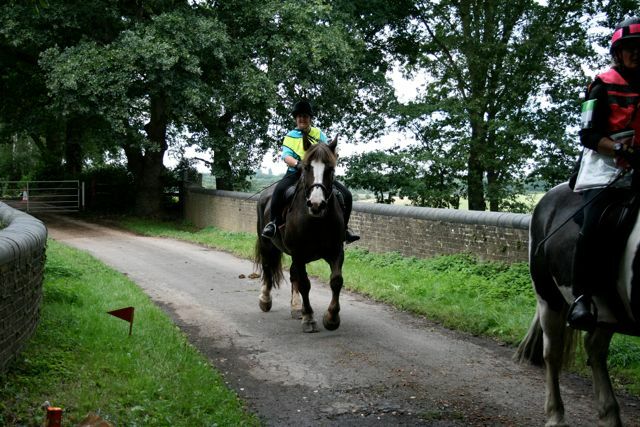 The results of the competition can be seen on the SE TREC website. This was to be the first time that I had attempted to organise a two day competition and certainly the first time that I had organised a Qualifier! I think that from my point of view, it is easier to run a two day competition — especially when the competitors are doing most of the judging! I'm not sure that I would want to run a Qualifier again though! 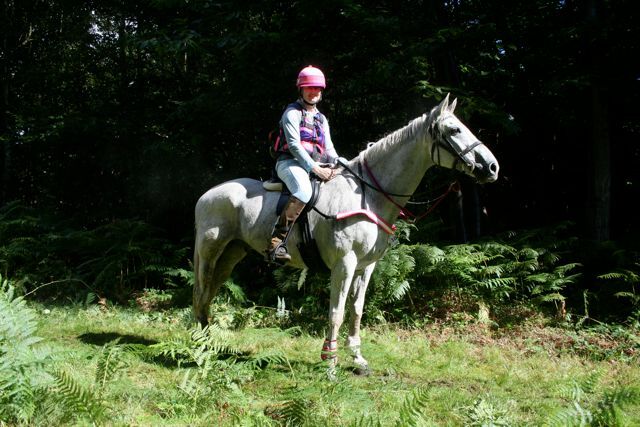 We had a very good entry of 95 competitors, of which only 37 had entered for the Qualifier which did not raise enough money to pay the vet to be there on all three days, so we had to rely on our excellent ACPs — Lissy Ungaretti and Mary Mackenzie — to vet the entries on the Sunday. 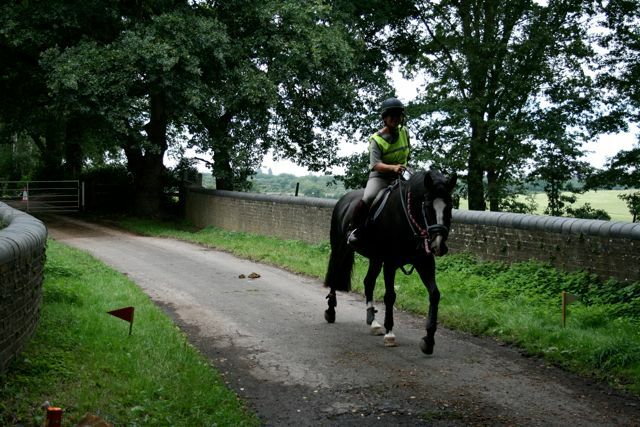 Sadly, we only had 13 entries for the Levels 3 and 4 of which only 11 actually competed. Whether this was due to the fact that this was to be the final qualifier before the Championships and most people had already qualified, or whether people thought that the POR would be mostly roadwork as we are so close to London, I'm not sure, however this was a somewhat disappointing turnout considering the extra effort that it takes to put on Level 3 and 4. Having planned all areas, applied for and received licences from departments various, I was finally ready to start pinning direction notices up all over the venue and the Claygate roads by about 12.30 on Friday. I had a lot of help from Lissy Ungaretti, Carol House and Pauline Humphries. Meanwhile Phil Hammond was giving Stella Milne and Monica Daniel a hand loading the obstacles onto Stella's trailer to bring up to the venue ready to start course building first thing on Saturday. Competitors started to arrive at around 2pm and soon the Racecourse field started to look like a TREC venue which was lovely to see. Our vets, Will Thomas and Lorna Broughton arrived promptly at 5pm and started vetting the Qualifier entries with assistance from Lissy Ungaretti. After the vetting had completed and having eaten a wonderful meal cooked by Steve, we made our way over to Bob and Di Cripps' house just a mile or so away. I didn't realise that 'a few nibbles' actually meant a full-on meal, which we were too full to eat, but I managed to pack away some Eton Mess which was wonderful and Steve tucked into a sumptuous looking cheeseboard! All washed down with lots more vino, plus loads of good conversation and laughs — just like a TREC should be! So back to the lorry then for a good night's sleep and an early rise the following morning much to Steve's disgust (any time before 6.30am does not exist for him!). The first competitor was due at the Equipment Check which was being judged by Bronwen and Bryony Barton at 8.10am while Joy Taylor, our TD, set up and briefed the Map Room judges, Renate Konn and Pauline Humphries, I was adding a few extras to the judges' lunches, kindly supplied by BGI Electrical Ltd. Soon it was time to set off with judges in tow to checkpoints, manned tickets, obstacles various and road crossings. Joy and I split into different directions and I went to Horringdon Farm with four cars including Chris Sterling, our photographer, following me. Unfortunately, as I was turning the corner into the field where Carol House and I had set up a direct bearings test for Levels 3 and 4 on the previous day, I drove over a sawn off tree stump and promptly sank up to the axel in soft earth. I was not going forward and I was not going backwards! Shortly after, competitors started arriving to do the test and we had to put them on hold as they couldn't actually get into the field, not to mention that there weren't any checkpoints set up! I have to say that Hilary Barnard was marvellous and she masterminded the 'get Jenny's van out of the way so that we can get on with the competition' operation with great dexterity! Pat Cooper walked up the field to set up a checkpoint for Level 2 as I had been too late in phoning Pauline to prevent some Level 2's from leaving the venue. Her husband John remained with my van to help extract it. Once Joy arrived, I went with Judy Greenwood and Jill Hawkens to set up the Dip obstacle on Birchwood Lane and then as my van had by then been released and was seemingly OK to drive, much to my amazement — very grateful thanks to everyone who was there and who helped — I then took Romi Costantini to the Footbridge on Arbrook Common, went to see Verena Tomlinson and Jacqui Peterson at the Gate and crossing of Copsem Lane on Esher Common, and sent photographer Chris Sterling up to the Sandhill on Esher to take photographs (and a jolly good place it was too: see his photographs here. Ed). Meanwhile, the Level 2s had recommenced and Joy had asked other judges to make their way to their respective places or had placed them. They were Jenny Holmes and Cindy Wood as a bad manned ticket (I think Jenny means a manned bad ticket? Ed) on Arbrook Common, Lissy Ungaretti and Susan Sporle on West End Common, Vets Will Thomas and Lorna Broughton together with Mary Mackenzie at Fairmile Common (poor Mary was dealing with a busy road crossing, a checkpoint and the start of a bearings test as well, so I stayed with her to help). John Maclean and Sarah Reith were looking after a particularly nasty crossing at Oxshott Heath which was supposed to be a manned ticket as well but this had to be abandoned due to the sheer volume of traffic — race day at Sandown Park didn't help. Hugh Craddock had put tickets out and opened gates in Prince's Coverts (the shadow of the Valley of Death!) 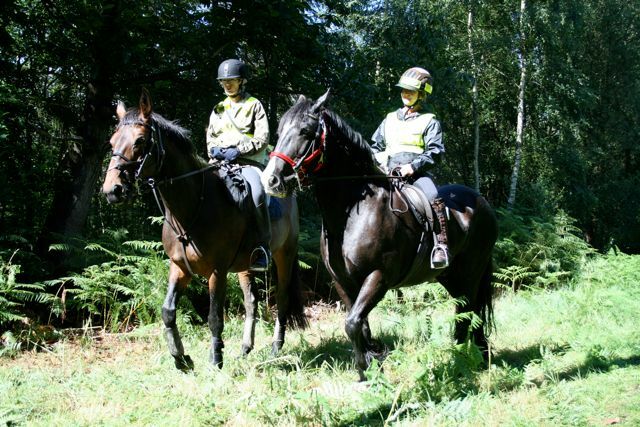 and was at his checkpoint and waiting for Maike Ahlgrimm to come and help him. Ros Dixon had made her way to her manned ticket point and so had Joy herself (both of them deep in Prince's Coverts, far from the car park! Ed). Thanks also to Natalie Douglas and Carol House who saw competitors safely across Fairoak Lane on the return trip and also to Janet Cunningham for looking after the final checkpoint on Claygate Common in the pouring rain. By mid-afternoon the torrential rain had stopped, thank goodness, and we had an excellent turnout for the guided course walk, given as always by our illustrious TD, Joy Taylor. For once, I was actually able to join the course walk — this was another first for me as at this time I am usually the one scrabbling around trying to flag up and number the course preferably without being run down by the people actually walking it! However this year the course was super, efficiently dreamt up by Zoe White and built by Zoe, Phil Hammond, Stella Milne and Monica Daniel. 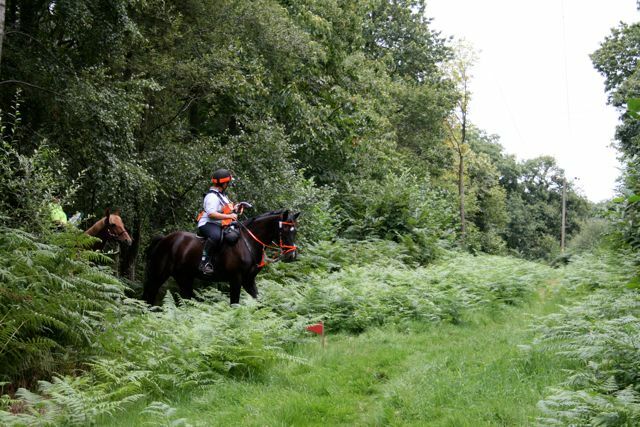 The PTV course looked lovely although we did have to make a few adjustments to the CoP of 150m on Sunday morning as it was originally rather too narrow in places. Joy decided to make the time allowances generous as the lower track was quite slippery after the rain and we were concerned about members of the public not moving out of the way when requested despite the 'Advance Notification' signs that I had plastered around the landscape. Around 7.30pm the Khasturi Indian Take Away delivered our Indian Banquet and we all tucked in. It was absolutely delicious and enjoyed by everyone. 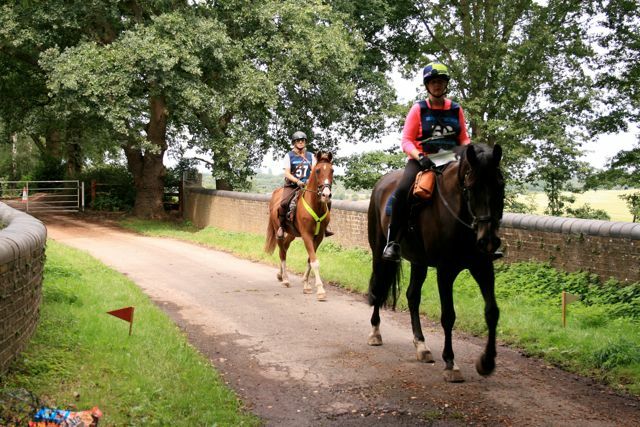 It was really good to be able to welcome Daphne Barker, who had kindly arranged for us to be able to use the Racecourse Field as our venue and also generously supplied a new gate at Common Lane (so that we could get in!) and a new trough and standpipe at the top (so that we had human quality drinking water). Also there were our other major land owners Janet and Jim Miller who allowed us to access Horringdon and Loseberry Farms. After our meal we were entertained by John Maclean and his Accordion, where a lot of people appeared to be in fine voice! The evening was rounded off with Unmounted Gymkhana Games masterminded by Graham Clack and Lorraine Cook. The winning team were Carol Dolby-Brown and Emma Andre. About 9.45pm a slightly dishevelled Joy Taylor and Steve Moulton reappeared out of Steve's lorry with the provisional results for Saturday's POR. These were eagerly looked over by those competitors who were still up and about. The following morning was also an early start for poor old Steve who did not want to get out of bed! I whizzed round the loos to make sure that they were still fit to use and to replenish loo paper. The final vetting commenced at 7.00am as it was mainly Levels 3 and 4 competitors that were judging the Level 2s. This vetting was taken by the Appointed Competent Persons who were Lissy Ungaretti and Mary Mackenzie. The judges briefing started at 7.30am as the PTV for Level 2 started at 8.15am. Grateful thanks to all those that made it to the briefing and helped out. They were Stella Milne and Monica Daniel both looking after the CoP all day, Bryony Barton: CoP Level 2, Jill Perry: Starter, Kay Kitson: Low Branches, Emma Andre: Led Corridor, Di Cripps: Mount from a Block — Di judged this all day as Helen Bolton judged the Water Crossing or Immobility in the Water for Level 3 and 4 all day. Diana Maclean: Ridden Incline Down, Jo Carr: the Log, Tania Draper looked after the S Bend all day, Gemma Slaven: the Corridor, Jane Cullis: the Maypole (kindly lent by Steve Moulton), Bronwen Barton: Bending, Hilary Barnard: Immobility, Claire Pollard: Led Incline Up and Jacquie Peterson timed the Finish. Carol (friend of Max's and giver of carrots and mints) did the Equipment Check, Renate Konn and Janet Cunningham kept the Map Room running to time. Horse holders were Lissy and Eleanor Mackenzie and anyone else who had a spare hand! Steve Moulton, assisted first by me and later by Jo Lee and Jane Sanders from the RDA, later still by Joy Taylor settled then down in his lorry to get the Levels 2, 3 and 4 results out by 5.30pm. This morning's taking round of judges was a lot more simple than the previous day and huge thanks go to Carol House for manning the Dip Obstacle on the way out of Great Oaks, Jim and Caroline Bowers for running the checkpoint just outside of Loseberry Farm on Arbrook Common, Mick and Petra Ingram for looking after the Copsem Lane crossing and judging the Gate obstacle, Jill Hawkens for sitting on the Sandhill on Esher Common all day and judging Ridden Incline Up for Level 1, John Maclean, this time with Vic Baylis, for once again manning the Warren Lane crossing, to Hugh Craddock, our traceur for looking after the Stokesheath Road railway bridge checkpoint, and finally to Trevor Brown for manning the final checkpoint for Level 1 at Highgate Cottage. There was a further judges briefing at 11.00am as it was now the turn of Level 2 competitors to go out and judge the Levels 3, 4 and 1, so very many thanks to the following people who willingly gave up their time to help out. Hazel McGoff — CoP, Veronica Crouch — Start, Diana Stewart and Graham Clack — Low Branches, Di Skippon — Led Corridor (and I think that Ali Large was around that area for most of the afternoon as well). Donna Leavens — Ridden Incline Down, Sarah Leggat — Reinback, Lisa Geer and Jo Carr — Log, Trevor Brown — Corridor, Ri Levett — Maypole, Linda Hughes — Bending, Nicky Cameron — Immobility, Sally King — Led Incline Up and Christina Sutton on the Finish. Toni and Ben Izard meanwhile were serving up a fabulous ploughman's lunch, homemade cakes and cream teas. 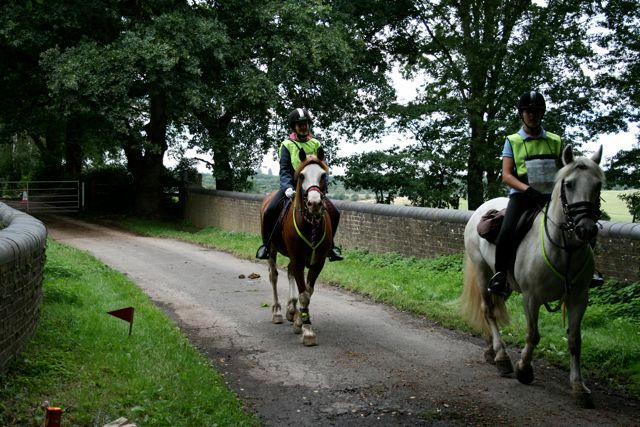 Daphne and Lissy had organised a team of Pony Club girls to come round the PTV course at intervals to pick up score sheets and hand out refreshments to judges. It would seem that a great weekend was had by most and I would like to thank in particular those who I felt went well beyond the call of duty to help out and they are Zoe White, who just didn't stop all weekend. 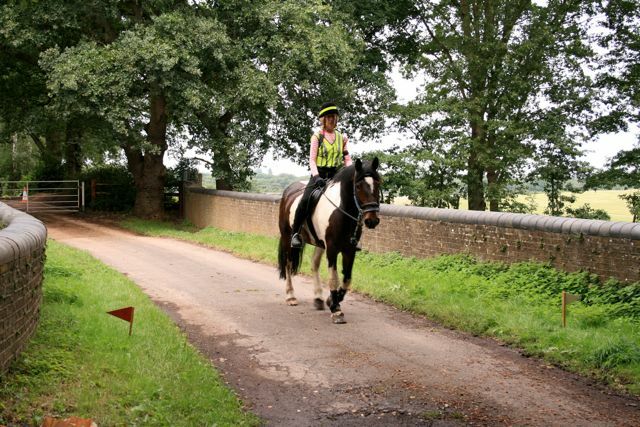 Lissy Ungaretti who not only didn't stop all weekend but also carried on on Monday! Steve Moulton, who I feel may have forsaken a place at the Championships due to taking too much on, supporting me and encouraging me every inch of the way. Hilary Barnard for getting me out of big trouble and of course Joy Taylor for being our fabulous TD. 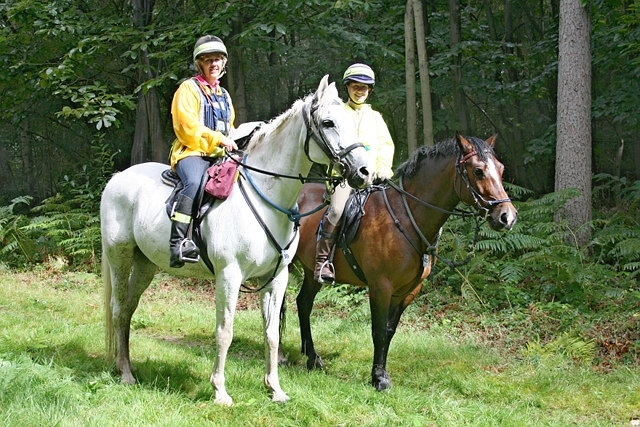 This year's POR was unusual in that, despite taking place on the fringes of Greater London — part of the POR fell within the former London Metropolitan Police Area, witnessed by the white Corporation of London tax posts which some competitors may have seen en route — very little of the POR was on public bridleways and roads. 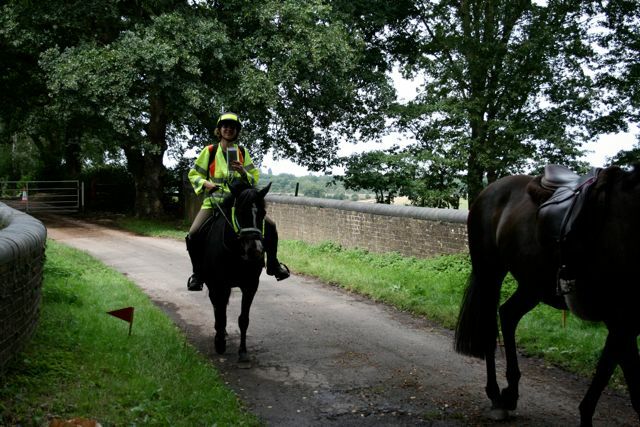 At level 2, 500 metres coincided with public bridleway shown on the OS map, mainly along Birchwood Lane, with a further 800 metres along New Road, a 'byway open to all traffic' (which is in fact closed to vehicles): and just 300 metres along public road: a total of 8% of the POR length. Setting the POR is a collaboration between the traceur (me), the organiser (Jenny), and the TD (Joy Taylor). This one seemed to be particularly successful: Jenny took the lead in negotiating access to the Barwell Estate (including Sixty Acre Wood) and Loseberry Farm, and setting routes across these lands, while Joy was her usual effective self in testing the proposed routes and ensuring that they were both safe and enjoyable. Thanks to them both, particularly as I got things off to a particularly late start this year. Please note that access to land at Barwell, Sixty Acres Wood, Great Oaks Wood and Loseberry Farm was by kind permission of the proprietors, and is not otherwise available. Access to Prince's Coverts is by licence from the Crown Estate. 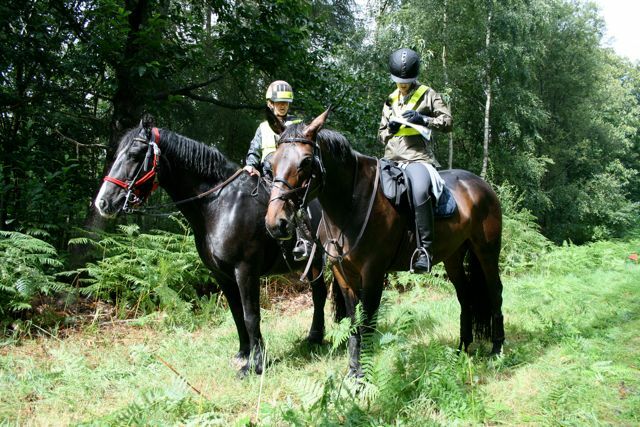 Access to the Elmbridge Commons and Oxshott Common is via the horse rides (marked on a map available from Elmbridge Borough Council and currently available here). As the POR routes at different levels were often quite distinct, separate reports appear below at levels 1, 2, and 3/4. For obvious reasons, descriptions may be repeated where appropriate. Please note grid references (and hyptertext links) shown for ticket locations are approximate only. Level 1 competitors initially set out across the A3 on the bridge leading to Barwell, before turning right along a bridle track between the A3 and the lake below Winey Hill: this section of the route, and through Sixty Acre Wood beyond, was by kind permission of the Trustees of the Barwell Estate, who were also host to the competition site. 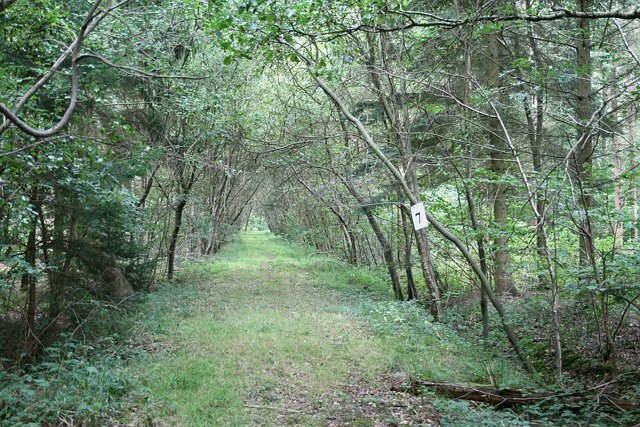 Entering Sixty Acre Wood, competitors soon turned east and ascended a modest slope before turning right at the eastern fringe of the wood (anyone emerging out of the wood would have found themselves on the southern vehicular exit from Chessington World of Aventures, from which the screams of visitors enjoying (or otherwise) the rides can often be heard). The path continued along the east boundary of the wood, before reaching a gate and logging area near the junction with Fairoak Lane. Here, the path turned west, inside the wood but parallel to the busy Fairoak Lane, before following three sides of a square through recently coppiced woodland, with a ticket on display (TQ16456194), found by all but one individual and two pairs at level 1. The route turned right, over the ancient bank between Sixty Acre Wood and the Crown Estate's Great Oaks, and then followed a good, easy going path east to the junction with New Road. New Road, despite its name, is an old road, now a byway open to all traffic, linking Claygate with Fairoak Lane, but is closed and gated to prevent use by motor vehicles. However, riders were to return along New Road later, but instead, continued straight across, and met an obstacle on the PTV: riding across a dry ditch. Continuing west along Birchwood Lane, competitors soon left the public bridleway, taking a route alongside and across fields belonging to Loseberry Farm, by kind permission of Janet Miller. The route passed under the A3 via 'Graffiti Tunnel' (whose name requires no explanation), and across two pastures to arrive at Horringdon Farm railway tunnel (a private accommodation passage under the Guildford to Waterloo surburban line). Leaving the railway, and passing along the edge of two fields, a bridge over a ditch was reached, followed by a direct line across the last field. 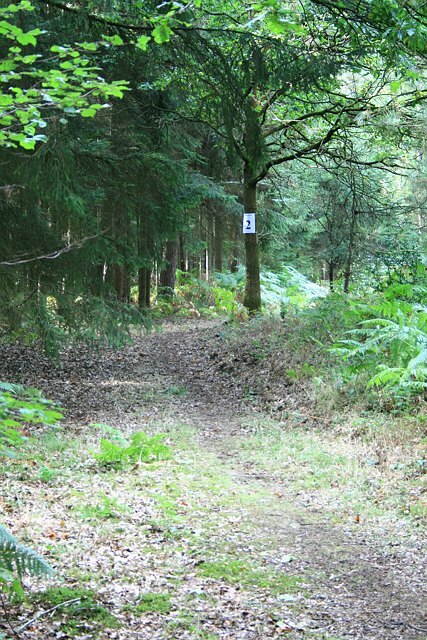 A correct alignment (possibly confirmed by a bearing) would have brought competitors to a small opening onto Arbrook Common (there was no other way onto the common, so it was important to get the alignment right: two pairs failed to pass this checkpoint, and we assume they must have used Birchwood Lane instead). Arbrook Common is a Metropolitan Common, and the first of several Elmbridge Commons to be encountered on the POR. 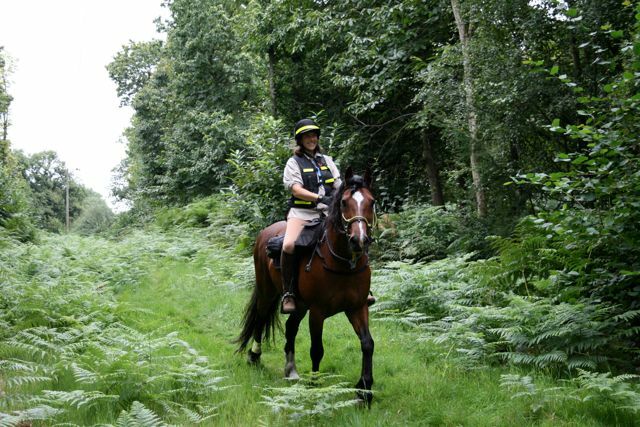 All of the commons are owned by Elmbridge Borough Council, and accessible via a network of horse rides. 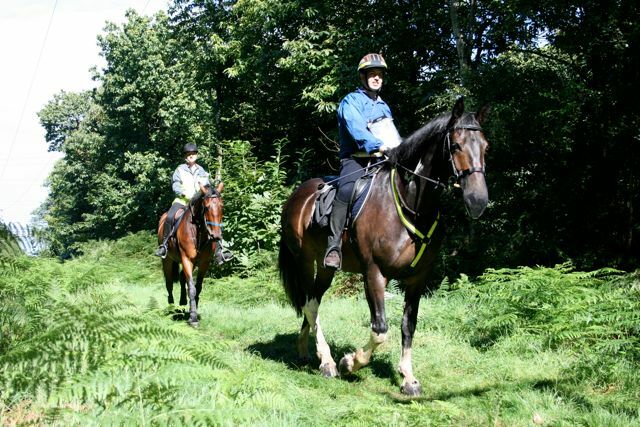 Riders needed to pick up a path heading west, before turning south along an established horse ride — those turning too soon would have picked up 30 penalties at a manned bad ticket. A tricky section followed close to the electricity transmission line, where riders were expected to navigate the right way round one of two possible routes via a pylon: however, those having difficulty finding the route were rewarded only with time penalties, as there was no ticket here. Heading broadly west from the pylone, a series of short paths from here soon brought riders close to the transmission line again, and through a gate, also marked at a PTV obstacle, out onto Copsem Lane, now the A244, where a marshal assisted riders across the busy traffic. The route west of Copsem Lane lay along the most direct route across Esher Common, towards the A3 at East Bridge (one of two bridle bridges connecting the two divided halves of Esher Common), over the bridge, and continuing south past the pond along a sandy ride, before crossing the manorial boundary onto Oxshott Common, followed by a rather more demanding crossing of Sandy Lane. 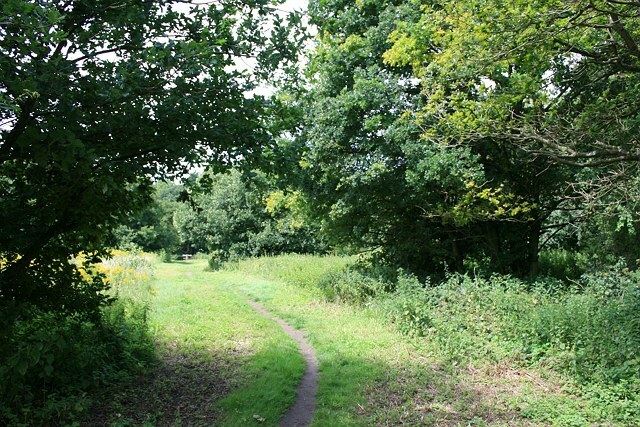 Oxshott Common is also owned by Elmbridge Council, but uniquely, is managed by a board of conservators established under a local Act of Parliament passed in 1904. Competitors needed to watch very carefully for an obscure left turn (TQ14226123), off the main horse ride, just before the car park near Oxshott Station, which took them across Warren Lane (the A244 again) and onto a pleasant, isolated patch of heath on the east side of the road (this crossing, although clearly marked on the OS map, had fallen out of use and was heavily overgrown). A marshal was posted to assist riders across the road, and to award penalties to those who missed the turning and ended up at the car park: however, the crossing proved to be so busy that it became impracticable to keep records. A little-used path led down off the heath to Heath Road (a one-way short cut from Warren Lane to Fairoak Lane), and straight across to follow a path along the edge of Oxshott Heath and along the backs of the gardens of the dwellings along Queen's Drive. Turning right into an alleyway, leaving the Heath behind, riders soon reached Queen's Drive, before turning left along this private Crown Estate road, among some exceedingly desirable, and costly, homes. A right turn was called for into Stokesheath Road, with views north across Arbrook Farm lands and the A3 beyond, before passing through a gate and over a bridge across the same railway line encountered earlier at Horringdon Farm, and into checkpoint 2 just south of the bridge (see the level 1 photos above). Eventually arriving at the junction of Stokesheath Road and Fairoak Lane, a short ride of 300m was required along this busy road, before turning right through an open gate along a finger of Prince's Coverts. The land to the east, now occupied here by further upmarket residential properties, was formerly Brickyard Plantation, and this track was once a ride forming the western boundary of the Coverts, with farmland to the right. 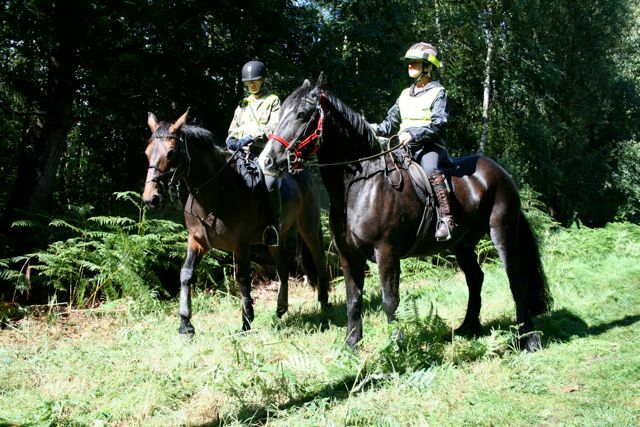 Access to Prince's Coverts and its excellent tracks and rides was by kind permission of the Commissioners of the Crown Estate. 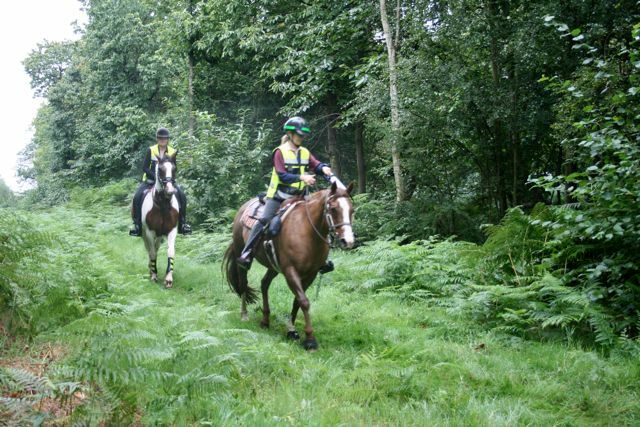 Immediately beyond the end of the boundary of Ashley Lodge, riders should have turned left, crossing another ride via a slight stagger (marked as such on the map), and picking up a ride along the boundary of a recently enclosed plantation (fenced to exclude grazing deer) ahead and then right. A sharp left turn took competitors back through the Heckets towards the boundary with Fairoak Lane (but separated by a fence), followed by a sharp right turn towards The Avenue, with a ticket displayed on the right hand side (no. 7: TQ15566168: the second and last on the level 1 POR): about half of competitors missed this ticket, although owing to having slipped a little in the wind, it was not as clear as it ought to have been. 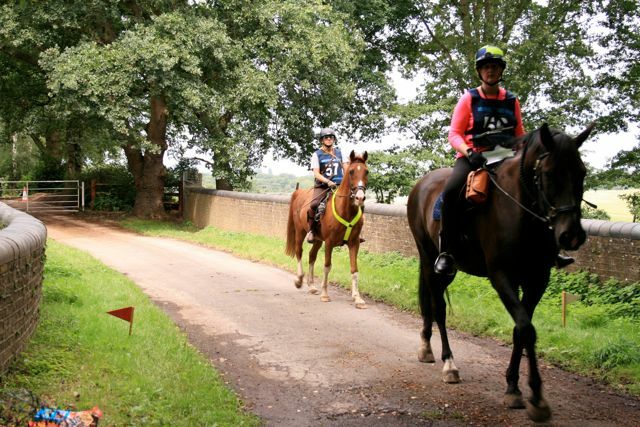 Riders now turned left into The Avenue to Highgate Cottages to reach the final checkpoint 3, 12.2km from the start. From here, it was a 1.5km walk back to the TREC event site at Barwell racecourse field. Level 2 competitors initially set out across the A3 on the bridge leading to to Barwell, before turning right along a bridle track between the A3 and the lake below Winey Hill: this section of the route, and through Sixty Acre Wood beyond, was permitted by kind permission by the Trustees of the Barwell Estate, who were also host to the competition site. Entering Sixty Acre Wood, competitors soon turned east and ascended a modest slope before turning right at the eastern fringe of the wood (anyone emerging out of the wood would have found themselves on the southern vehicular exit from Chessington World of Aventures, from which the screams of visitors enjoying (or otherwise) the rides can often be heard). Level 2 riders had to watch for a right turn shortly back down hill, before picking up a path contouring along the slope, to find the first ticket (no. 3, TQ16456194). 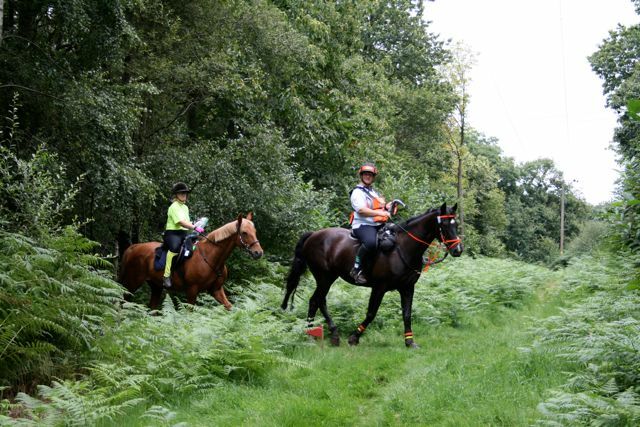 It was important to turn left again, uphill, before the path emerged under the electricity transmission line, and resume along the east boundary of the wood, now under the transmission line, before reaching a gate and logging area near the junction with Fairoak Lane. Here, the path turned west, inside the wood but parallel to the busy Fairoak Lane, before following three sides of a square through recently coppiced woodland, with a ticket on display (TQ16456194): both this and the preceding ticket were found by all but one pair at level 2. The route turned right, over the ancient bank between Sixty Acre Wood and the Crown Estate's Great Oaks, and then followed a good, easy going path east to the junction with New Road. New Road, despite its name, is an old road, now a byway open to all traffic, linking Claygate with Fairoak Lane, but is closed and gated to prevent use by motor vehicles. However, riders were to return along New Road later, but instead, continued straight across, and met a PTV obstacle: riding across a dry ditch. Continuing west along Birchwood Lane, competitors soon left the public bridleway, taking a route alongside and across fields belonging to Loseberry Farm, by kind permission of Janet Miller. The route passed under the A3 via 'Graffiti Tunnel' (whose name requires no explanation), and across two pastures to arrive at Horringdon Farm railway tunnel (a private accommodation passage under the Guildford to Waterloo surburban line), where checkpoint 2 was reached on the far side: all riders at level 2 correctly routed in to the checkpoint. Leaving the checkpoint, and passing along the edge of two fields, a bridge over a ditch was reached, followed by a direct line across the last field. A correct alignment (possibly confirmed by a bearing) would have brought competitors to a small opening onto Arbrook Common (there was no other way onto the common, so it was important to get the alignment right). Arbrook Common is a Metropolitan Common, and the first of several Elmbridge Commons to be encountered on the POR. 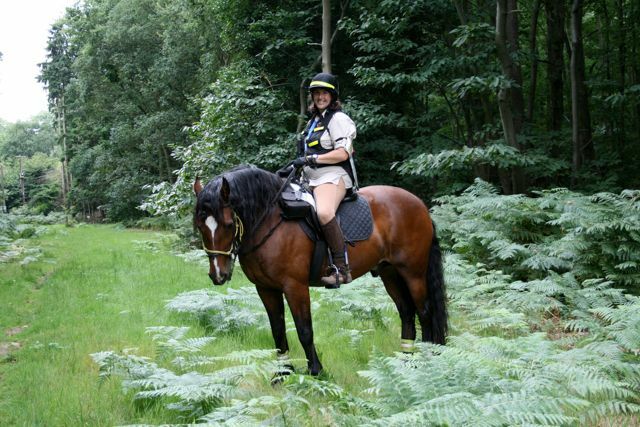 All of the commons are owned by Elmbridge Borough Council, and accessible via a network of horse rides. Riders needed to pick up a path heading west, before turning south along an established horse ride — one pair and one individual turned too soon and picked up penalties at a manned bad ticket. A tricky section followed close to the electricity transmission line, where riders were expected to navigate the right way round one of two possible routes to arrive at a pylon marking the turn south towards the footbridge at the southern end of Arbrook Common: however, those having difficulty finding the route were rewarded only with time penalties, as there was no ticket here. The footbridge was marked as an obstacle on the PTV. A right turn soon brought riders out onto the north-south ride (marked on the map, accommodating a water main) before passing again under the transmission line, turning sharp left and through a gate, also marked at a PTV obstacle, out onto Copsem Lane, now the A244, where a marshal assisted riders across the busy traffic. The route west of Copsem Lane lay along a series of horse rides, often with excellent going, across Esher Common, taking riders partly along the Meadway path, towards (but not across) East Bridge, and as far west as the Portsmouth Road before heading south back to the A3, and then east alongside the A3 to West Bridge (one of two bridle bridges connecting the two divided halves of Esher Common). 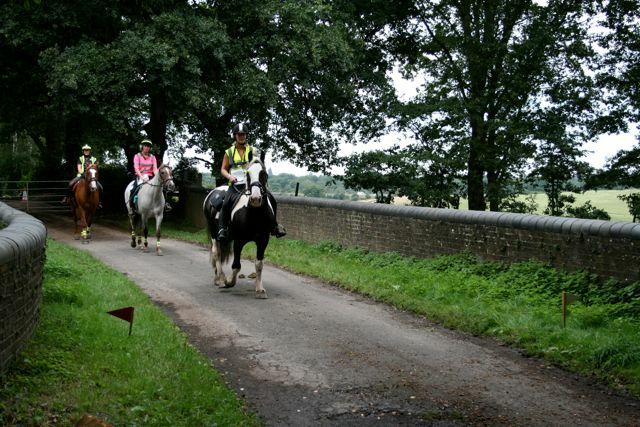 Crossing the bridge, with heavy traffic passing below, and turning left, brought riders to checkpoint 3. Two individuals, and one pair, at level 2 managed to miss the correct turn to the checkpoint, and arrived by another longer way round (which was actually the level 3 route). 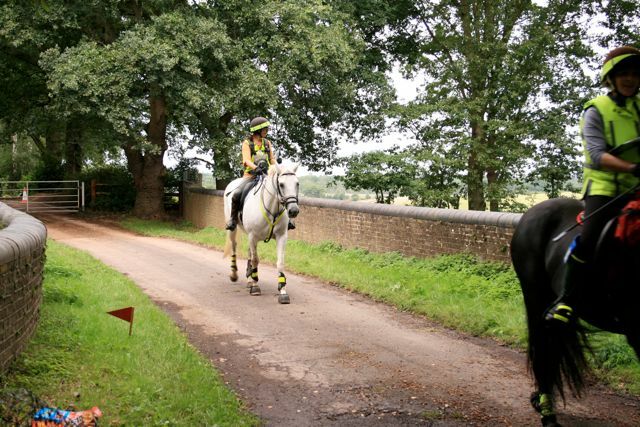 Leaving the checkpoint, riders continued along horse rides east, south-east and south, before crossing the manorial boundary onto Oxshott Common, followed by a rather more demanding crossing of Sandy Lane. Oxshott Common is also owned by Elmbridge Council, but uniquely, is managed by a board of conservators established under a local Act of Parliament passed in 1904. Competitors needed to watch very carefully for an obscure left turn (TQ14226123), off the main horse ride, just before the car park near Oxshott Station, which took them across Warren Lane (the A244 again) and onto a pleasant, isolated patch of heath on the east side of the road (this crossing, although clearly marked on the OS map, had fallen out of use and was heavily overgrown). A marshal was posted to assist riders across the road, and to award penalties to those who missed the turning and ended up at the car park: however, the crossing proved to be so busy that it became impracticable to keep records. 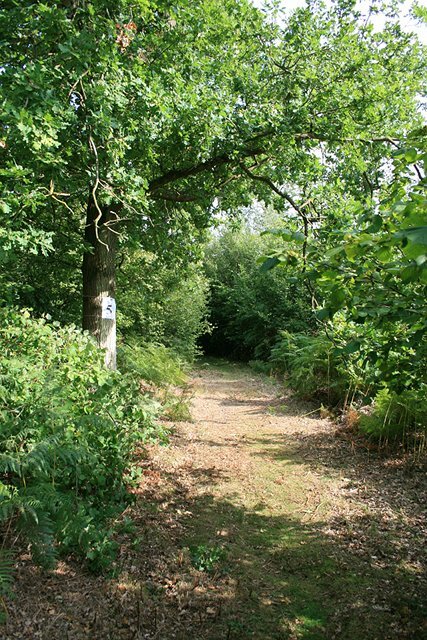 A little-used path led down off the heath to Heath Road (a one-way short cut from Warren Lane to Fairoak Lane), and straight across to follow a path along the edge of Oxshott Heath and along the backs of the gardens of the dwellings along Queen's Drive. Turning right into an alleyway, leaving the Heath behind, riders soon reached Queen's Drive, before turning left along this private Crown Estate road, among some exceedingly desirable, and costly, homes. A right turn was called for into Stokesheath Road, with views north across Arbrook Farm lands and the A3 beyond, before passing through a gate and over a bridge across the same railway line encountered earlier at Horringdon Farm. The gate is closed to vehicles, so that Stokesheath Road is divided into two parts, and there is therefore no through traffic. Eventually arriving at Fairoak Lane, a short ride of 300m was required along this busy road, before turning right through an open gate along a finger of Prince's Coverts. The land to the east, now occupied here by further upmarket residential properties, was formerly Brickyard Plantation, and this track was once a ride forming the western boundary of the Coverts, with farmland to the right. 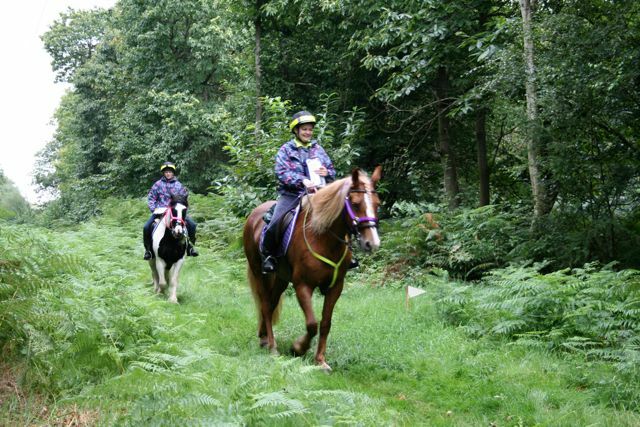 Access to Prince's Coverts and its excellent tracks and rides was by kind permission of the Commissioners of the Crown Estate. 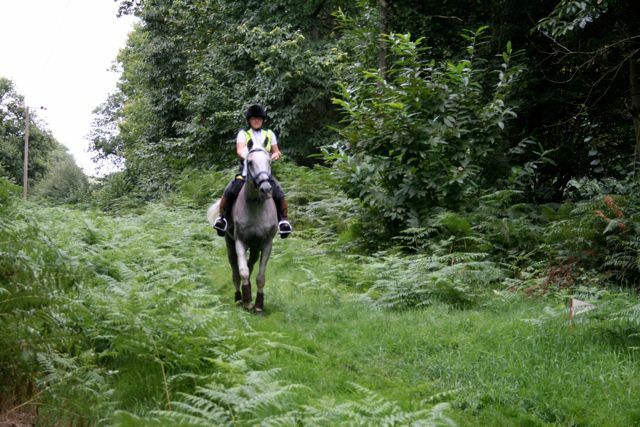 Immediately beyond the end of the boundary of Ashley Lodge, riders should have turned left, crossing another ride via a slight stagger (marked as such on the map), and picking up a ride along the boundary of a recently enclosed plantation (fenced to exclude grazing deer) ahead and then right. Crossing the main semi-surfaced west ride (level 2 riders would return this way a little later), they continued south-east along a new ride not marked on the map, which forms the eastern boundary of another new plantation, before turning left to reach the other main ride just north of Jessop's Well (the well house is hidden in the trees). Heading south along the main ride, competitors needed to watch for an inconspicuous turning on the left, followed by careful map work to reach the east perimeter ride just south of Bunker's Hill, with ticket 5 (see right, TQ16376071) en route: five individuals and five pairs missed this. They would then find the ride turned south-west, heading away from the perimeter, and into checkpoint 4: four individuals and four pairs at this level had navigational difficulties, and wrong-routed into the checkpoint along the intersecting ride (photographs from checkpoint 4 are above), while one individual missed it entirely (and another pair were called in from the main ride beyond). From checkpoint 4, riders passed the clearing at d'Abernon Chase and through two gates, picking up a series of rides heading broadly west and then north, where two tickets were on offer (no. 2: TQ16086010 & no. 8: TQ15926013), the latter to judge the correct route out of a six-way junction of paths, which everyone recorded correctly. 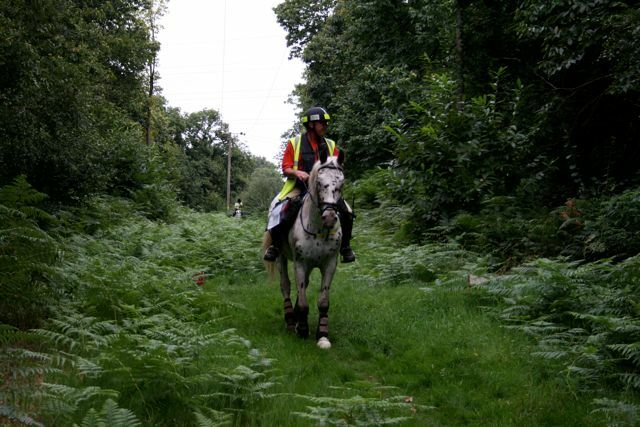 The last 200m north-west to the main west ride was across an area of clear-felled woodland where the ride had become indistinct and confused following forestry operations, and a manned ticket (Ros Dixon) awaited riders at the junction with the main ride (TQ15366068). 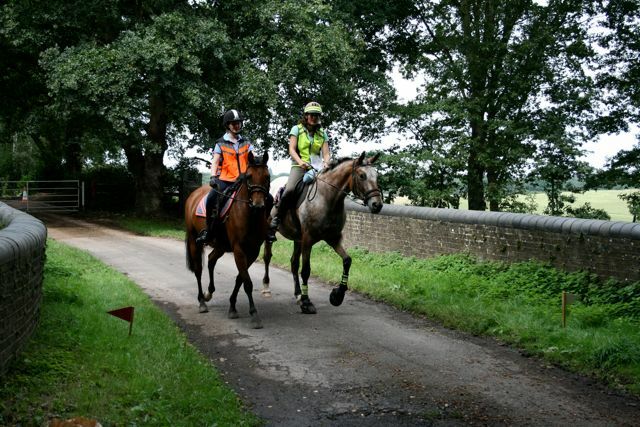 A surprisingly large proportion of riders successfully identified this part of the route (all but two individuals and two pairs at this level), although some found another way entirely, and were not seen here at all. Riders now continued north-east along the main ride, before turning north into The Avenue to Highgate Cottages and another crossing of Fairoak Lane onto New Road. A detour off the carriageway of New Road, just north of the electricity transmission line, was missed by nearly all riders, but the ticket (TQ15796227) was rescinded as it was decided that the detour was inadequately identified on the master map. Arriving at Coverts Road, riders turned right into Holroyd Road, and continued straight on along Common Lane along the west side of the Claygate Common. A final detour off the main track tested competitors' map reading at the very end of the 20.5km ride, with the final checkpoint 5 wrong-routing those who failed to spot it: three individuals and five pairs at level 2 missed this. From here, it was a short walk back to the TREC event site at Barwell racecourse field. All competitors made it to the final grid reference, but a few individuals lost points with wrong answers to the first two questions. 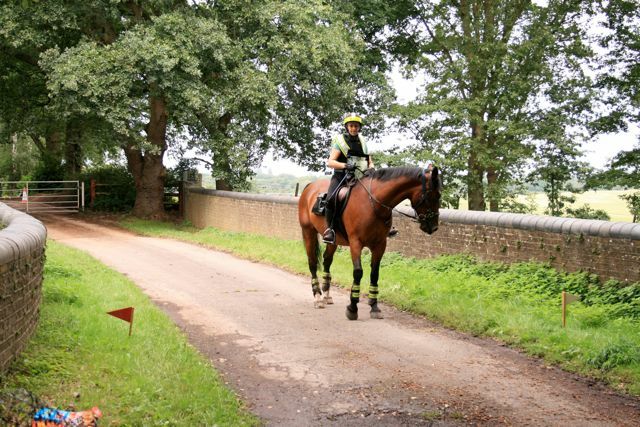 On arriving at the final grid reference, in Vale Road near Horringdon Farm, competitors begun a bearings test across the field to the west of Vale Road (this and the following fields were kindly made available by Janet Miller). 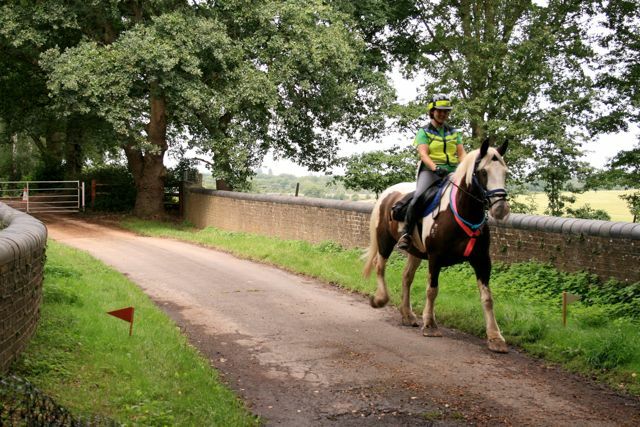 If followed correctly — and all got this right — riders ended up close to the railway bridge at Horringdon which was also used by levels 1 and 2, and into the checkpoint. Leaving the checkpoint, and passing along the edge of two fields, a bridge over a ditch was reached, followed by a direct line across the last field. A correct alignment (possibly confirmed by a bearing) would have brought competitors to a small opening onto Arbrook Common (there was no other way onto the common, so it was important to get the alignment right). Arbrook Common is a Metropolitan Common, and the first of several Elmbridge Commons to be encountered on the POR. 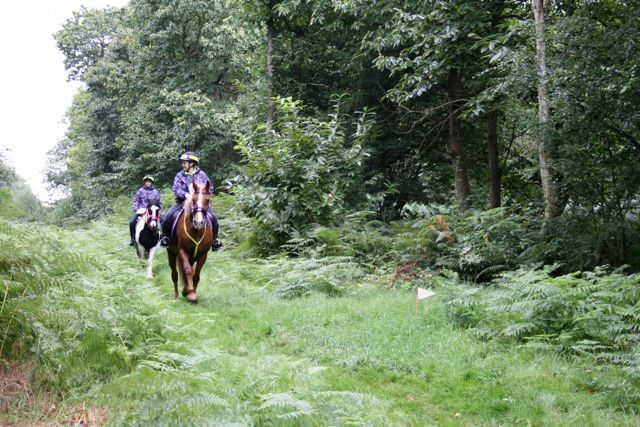 All of the commons are owned by Elmbridge Borough Council, and accessible via a network of horse rides. Riders needed to pick up a path heading west, before turning south along an established horse ride — those turning too soon (none did at levels 3 and 4) would have picked up 30 penalties at a manned bad ticket. A tricky section followed close to the electricity transmission line, where riders were expected to navigate the right way round one of two possible routes to arrive at a pylon marking the turn south towards the footbridge at the southern end of Arbrook Common: however, those having difficulty finding the route were rewarded only with time penalties, as there was no ticket here. The footbridge was marked as an obstacle on the PTV. A right turn soon brought riders out onto the north-south ride (marked on the map, accommodating a water main) before passing again under the transmission line, turning sharp left and through a gate, also marked at a PTV obstacle, out onto Copsem Lane, now the A244, where a marshal assisted riders across the busy traffic. 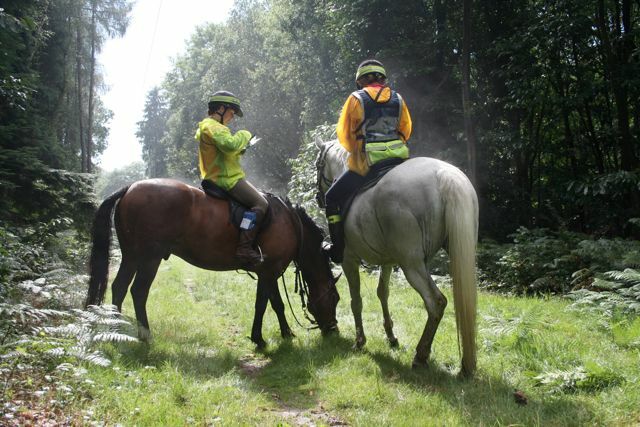 The route west of Copsem Lane lay along a series of horse rides, often with excellent going, across Esher Common, going first towards East Bridge on the same route as level 1s, where they headed east again around a circuit close to the Copsem Lane interchange (there was no ticket here, despite the propitious circumstances), before turning back west across the Common, with some excellent going, towards a crossing of the Portsmouth Road just south of the Blackhills turning. Here, some careful map work was required: riders initially headed uphill to join a ride going north along the boundary of the common and just outside The Ledges, and will have wanted to try to identify the turning off to the left to use on the return from a loop of West End Common (it was easy to miss, and some may have resolved to have a better look on the return). 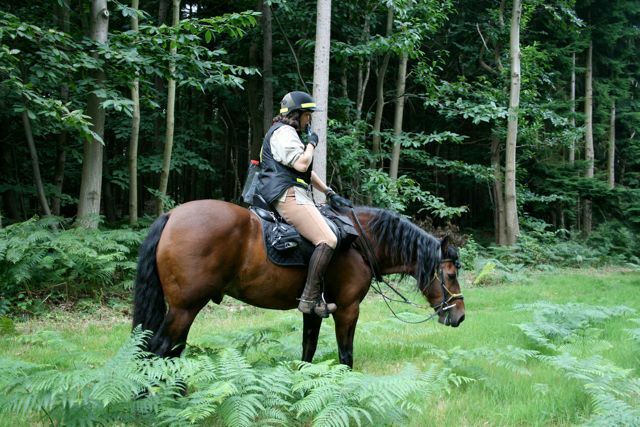 Few of the horse rides west of the Portsmouth Road are waymarked, although the route north to Winterhouse Farm still is, at least partly. Following this route would have brought riders to the Winterhouse Farm car park, before joining Winterdown Road, which despite its appearance on the map is busy with traffic to and from the nearby garden centre. Riders then turned right round the pond into West End Lane, past the cricket ground and back towards West End Lane car park. A very obscure turn was called for about 100m before the car park, using a bridge over a ditch (seen here) which has been overgrown and out of use for some years, but which is nevertheless the formal riding route onto the common from the Lane (quite why the horse ride does not begin at the car park is unclear), before climbing a steep bank (which marks the threshold of a former waste tip) onto a grassy ride (shown in the photo, emerging just in front of the overhanging tree): none of this section is waymarked. A manned ticket was deservedly located at the car park: only two individuals managed to right-route, while one pair evaded the checkpoint entirely (do let me know how…!). 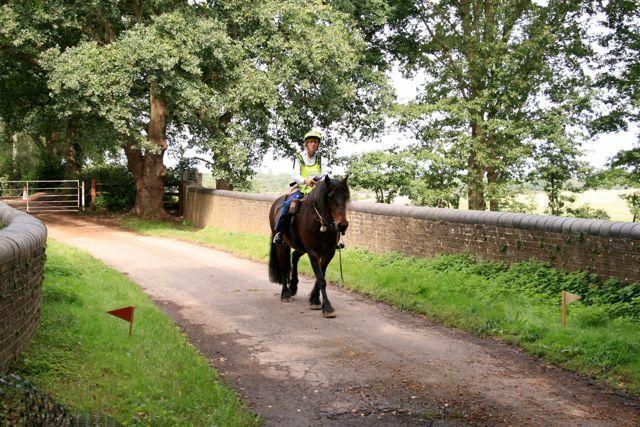 The route regained the outward route along The Ledges, where riders needed to identify the path forking off (now to the right) through the woodland towards Winterdown Wood, and continuing along a horse ride connecting West End Common with Fairmile Common. To the east of the path, riders may have noticed the outline of Homewood, a National Trust-owned modernist house designed by Patrick Gwynne. A brisk transit of Fairmile Common north of the A3 brought riders to the Cobham International School, where they should have turned right onto the old carriage drive to the formal gates which are locked out of use, before turning left along the perimeter of the common past the new entrance to the school (with security cabin), and eventually crossing the A3 on a bridge. 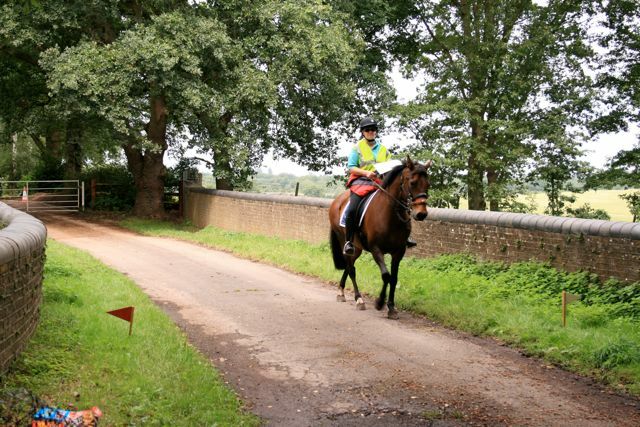 A left turn into a car park led to a bridleway across a bare area of common land, before arriving at the Portsmouth Road again, now opposite the Fairmile Common car park, where a checkpoint and veterinary check awaited, some 15.6 kms into the ride. All correctly routed into the car park. Levels 3 and 4 begun a second bearings test from the car park, taking them across Fairmile Common (south of the Portsmouth Road), past Middle Pond, and (if the bearings were correctly followed) arriving at the checkpoint near West Bridge also used by level 2. 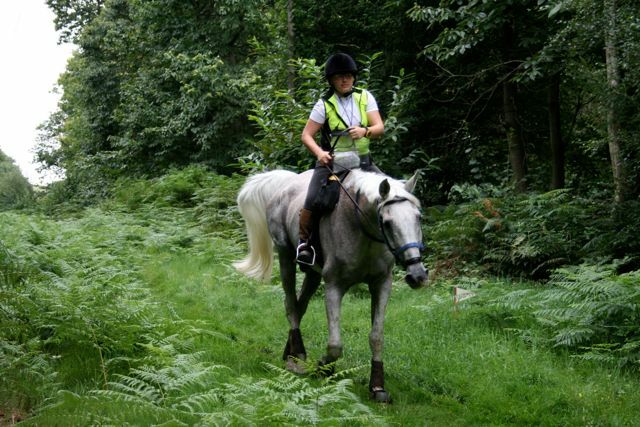 However, unlike level 2 competitors, the bearings test required competitors to eschew the more direct, obvious route into the checkpoint, and to ride a little further on, entering the checkpoint along a nearby forest ride: all but one pair at level 3 managed to right route in successfully. Eventually arriving at Fairoak Lane, a short ride of 300m was required along this busy road, before turning right through an open gate along a finger of Prince's Coverts. The land to the east, now occupied here by further upmarket residential properties, was formerly Brickyard Plantation, and this track was once a ride forming the western boundary of the Coverts, with farmland to the right. 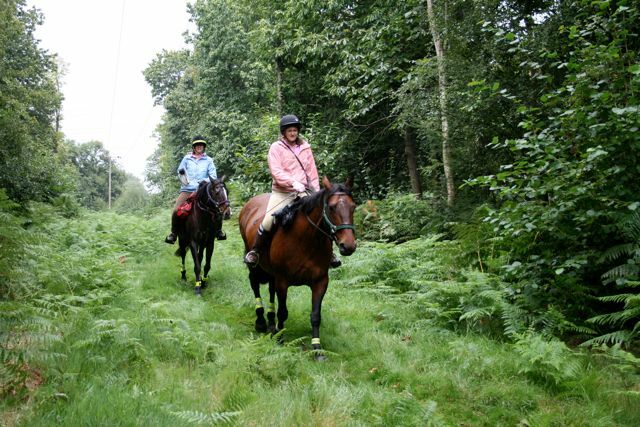 Access to Prince's Coverts and its excellent tracks and rides was by kind permission of the Commissioners of the Crown Estate. 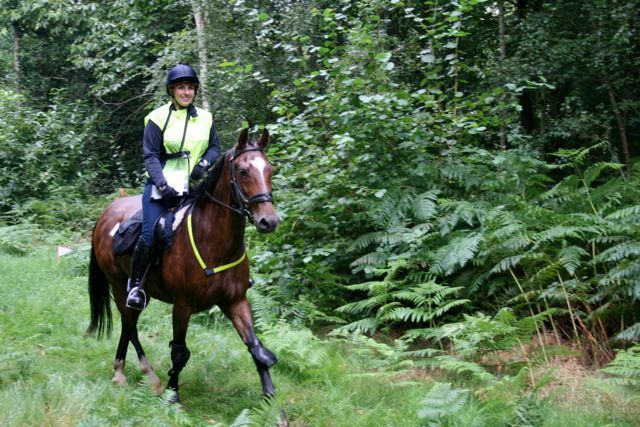 Immediately beyond the end of the boundary of Ashley Lodge, riders should have turned left, crossing another ride via a slight stagger (marked as such on the map), and picking up a ride along the boundary of a recently enclosed plantation (fenced to exclude grazing deer) ahead and then right. Crossing the main semi-surfaced west ride (level 3 riders would return this way a little later, and level 4 much later! ), they continued south-east along a new ride not marked on the map, which forms the eastern boundary of another new plantation, before turning left to reach the other main ride just north of Jessop's Well (the well house is hidden in the trees). 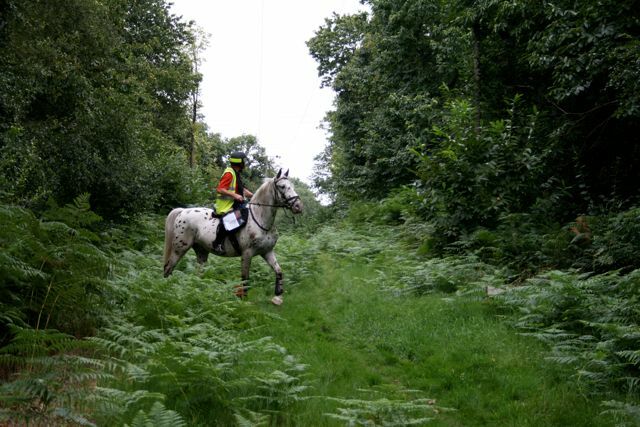 Heading south along the main ride, competitors needed to immediately turn left before Upper Gravel Pond, finding a way across a shallow ditch and across an area of clear-felled woodland in New Wood, to arrive at a ticket (TQ15996120) manned by the TD, Joy Taylor (who was inspired to set this test by her experience at a TREC in the Ardennes a few weeks earlier!). 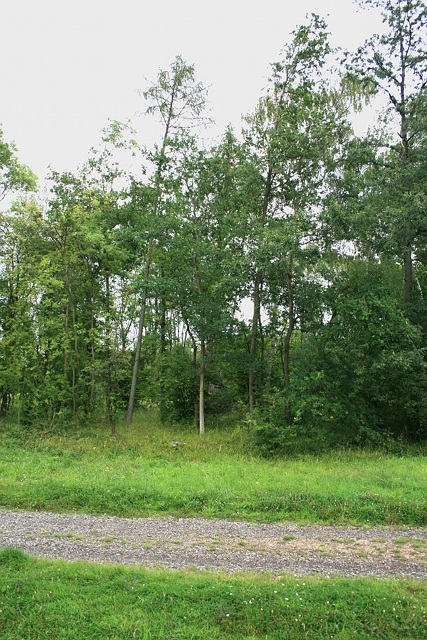 The way off the main ride can be seen in the photo, right, where the best route is just to the right of the tree stump in front of the silver birch tree in the middle, then bearing round to the left. All but one level 3 competitor got this wrong, passing round the south side of the pond, but the map was clearly marked to show that riders should pass it on the other side. 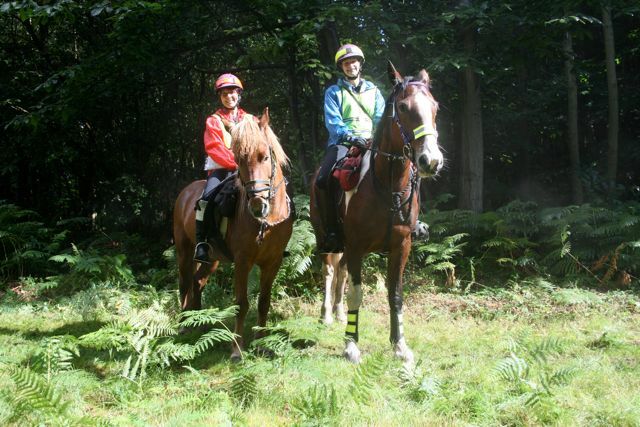 Riders then picked up a narrow, overgrown ride heading north, with a ticket on display (no. 6: TQ16016134), continued around the northern perimeter of Prince's Coverts, and then along the eastern perimeter, with the fields of Byhurst Farm (host to the 2005 Balanced TREC) on the left. A detour at Bunker's Hill along some overgrown rides brought the reward of a ticket (no. 5, shared with level 2, TQ16376071), but on returning to the east perimeter ride, level 3 and 4 riders had to pick up the less obvious ride heading south-west, away from the edge of the forest. Moreover, on approaching the checkpoint 6, the map showed competitors maintaining course on that same ride, and resisting the temptation to turn left and right into the visible checkpoint, until half-way across to the main ride beyond, whereupon they needed to cut through the screen of trees to emerge onto the grassy ride between a second pair of inconspicuous flags. 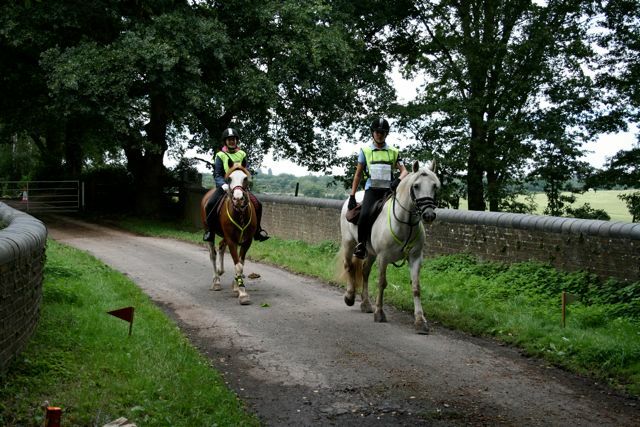 Three individual level 3 riders got this wrong (one individual missed the checkpoint entirely), and one pair, but commendably, the others were spot on. At checkpoint 6, the one remaining level 4 in the competition, Hilary Barnard, set off on a 10.8 km grid references test taking in Epsom and Ashtead Commons via the crossing of the Leatherhead Road at the Star. Details of the grid references are available in the POR workbook (Excel). 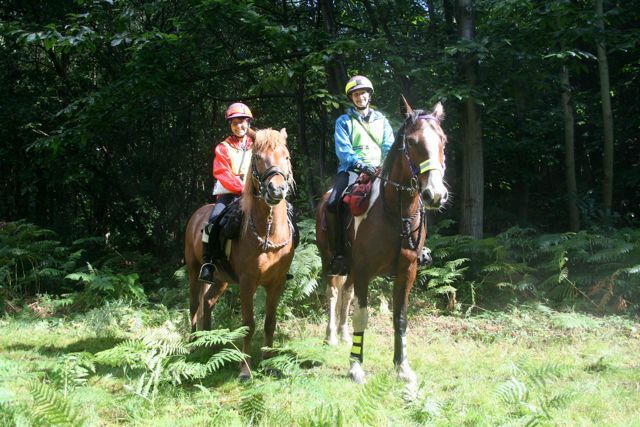 From checkpoint 6 (checkpoint 7 for level 4), riders passed the clearing at d'Abernon Chase and through two gates, picking up a series of rides heading broadly south-west and then north, past a dog-leg on Horns Hill around the corner of an area of heathland, and continuing north and west, where two tickets were on offer (no. 3: TQ15805984 & no. 8: TQ15926013), the latter to judge the correct route out of a six-way junction of paths: one individual at each level missed the first ticket. 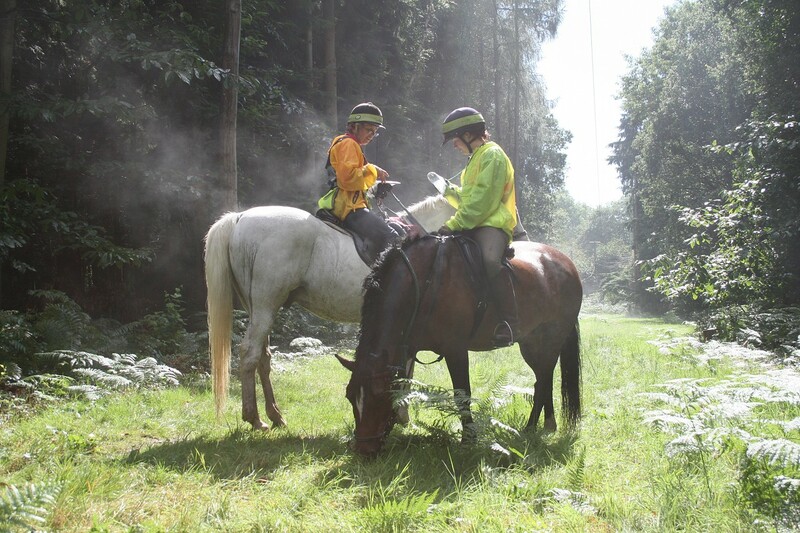 The last 200m north-west to the main west ride was across an area of clear-felled woodland where the ride had become indistinct and confused following forestry operations, and a manned ticket (Ros Dixon) awaited riders at the junction with the main ride (TQ15366068). A surprisingly large proportion of riders successfully identified this part of the route at both levels 2 and 3: one individual and one pair at level 3 missed the manned ticket. Riders now continued north-east along the main ride, on the same route back to Barwell as level 2, turning north into The Avenue to Highgate Cottages and another crossing of Fairoak Lane onto New Road. A detour off the carriageway of New Road, just north of the electricity transmission line, was missed by nearly all riders, but the ticket (TQ15796227) was rescinded as it was decided that the detour was inadequately identified on the master map. 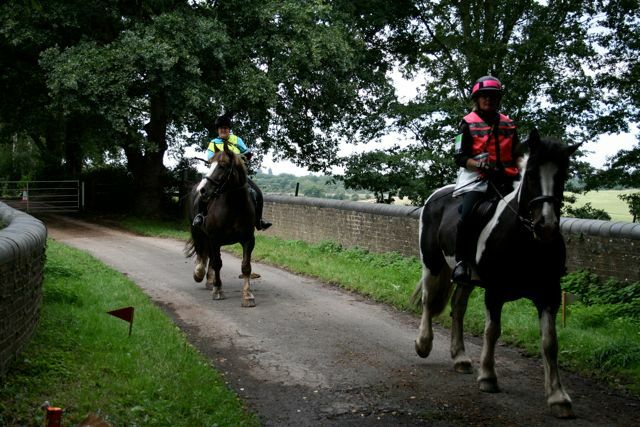 Arriving at Coverts Road, riders turned right into Holroyd Road, and continued straight on along Common Lane along the west side of the Claygate Common. A final detour off the main track tested competitors' map reading at the very end of the 30.9km or 41.7km ride, with the final checkpoint 7 (level 3) or 8 (level 4) wrong-routing those who failed to spot it: both pairs at level 3 missed this. From here, it was a short walk back to the TREC event site at Barwell racecourse field.